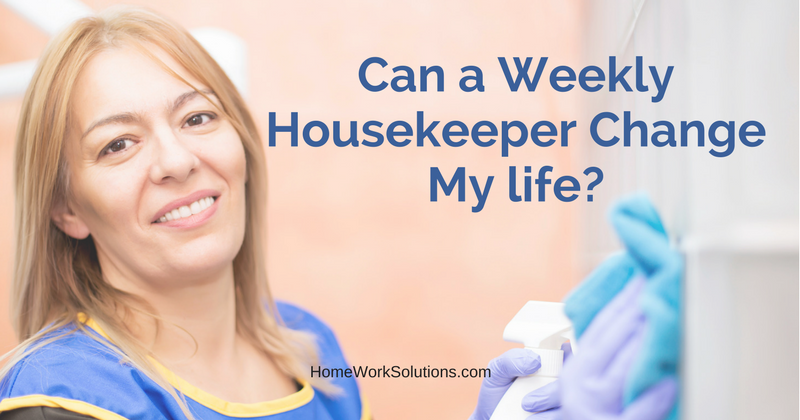 Can a Weekly Housekeeper Change My Life? Home / Our Blog / Can a Weekly Housekeeper Change My Life? The laundry is piling up, the dust bunnies are accumulating around the house, you have 2 soccer games to be at this weekend with your kids, and all you can think about is the mound of dishes in the sink that needs to be tackled. Life gets busy and sometimes it is so busy that we just don’t have the time to do what we need to do to keep on top of housecleaning. So you might be asking yourself, "Should I get a housekeeper?" If you’re feeling pressed for time, or you simply just dislike the idea of cleaning your home, it’s okay (and even necessary for some!) to hand off some duties to a weekly housekeeper. In fact, having a weekly housekeeper can change your life. It can alleviate some of the pressure you feel to have a clean house and give you more time to spend on the things you enjoy doing. Here are some additional reasons why hiring a housekeeper can make your life easier. Reason #1: It will help minimize stress. Does the thought of mopping all your floors or scrubbing your toilets make your blood pressure rise? Or, maybe looking at the dirt and dust around your house makes you feel like you’re not doing a great job in keeping up with things in life. For many people, the idea of regular house cleaning causes stress, so hiring a cleaning lady to help with that will instantly reduce anxiety. Clearing away things that cause stress in life will help you be happier and more level-headed. This translates to a healthier, happier home life in the long run! Reason #2: Housekeepers will save you time! Time is always ticking away and if you’re busy with day-to-day life activities, time is one of the most valuable things you can have. Cleaning your home will take time away from things that you love most, so consider hiring a house cleaner to take that to-do item off your plate. Having someone come on a weekly basis will keep things fresh and will make a difference in giving you more time to spend with your family or doing other things that you enjoy doing. A client who is a divorced dad with shared custody of his two young sons has his cleaning lady come twice weekly and arranges for her to wash linens, unload and load the dishwasher and keep the home in tip top shape so he is free to attend basketball practice and other after school activities with his boys. Reason #3: You deserve to give yourself a break. You deserve to have a clean home and it’s okay to give yourself a break. Regular housekeeping can take a big weight off your shoulders and you can empower and motivate yourself to invest in yourself. Do the nanny taxes apply to a cleaning lady? Depending on your arrangement, your housekeeper may be your employee, and you may have "nanny tax" responsibilities. This FAQ will help you determine if your cleaning lady is your employee. A great housekeeper can help change your dirty space into one that is welcoming and inviting. Not to mention, your home will be sparkling clean and you won’t have to lift a finger!